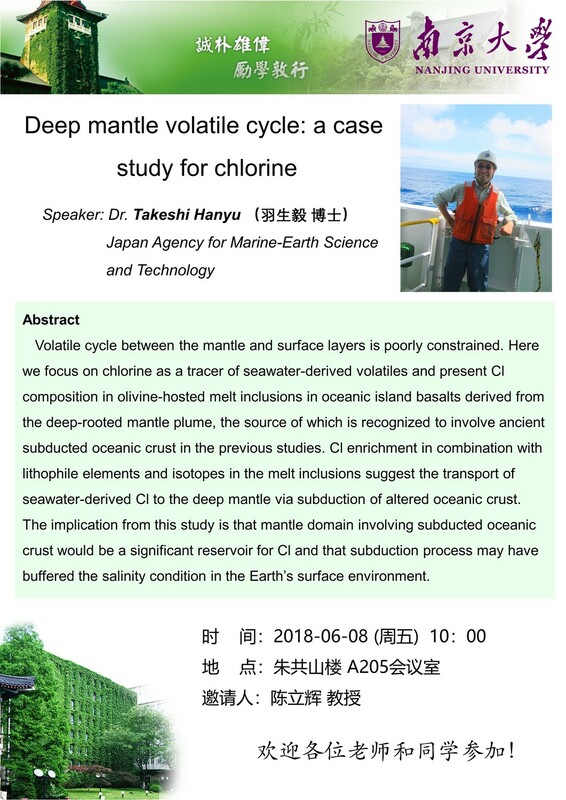 At the invitation of Prof. Li-Hui Chen, the senior scientist of Japan Agency for Marine-Earth Science and Technology (JAMSTEC), Dr. Takeshi Hanyu visited School of Earth Science and Engineering, NJU and gave a report titled “Deep Mantle volatile circle: a case study fpr chlorine” on May 8, 2018. 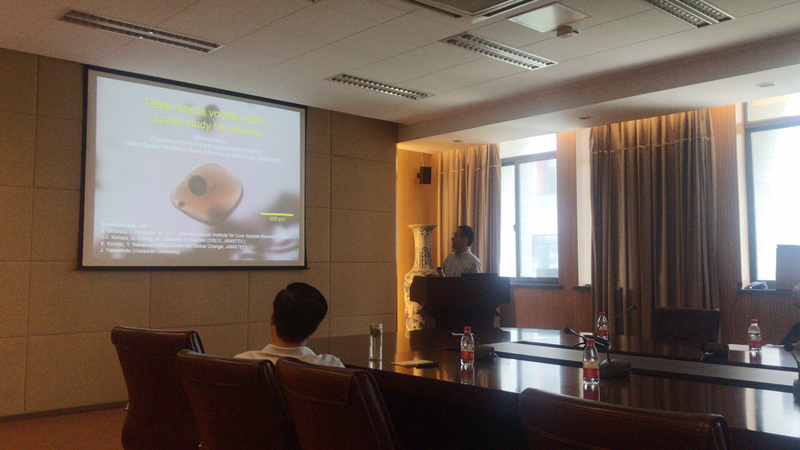 The report started at 10:00 p.m. in Room A205, Zhugongshan Building. Prof. Hanyu graduated from University of Tokyo and got a bachelor degree in 1992. After his earning doctorate from University of Tokyo in 1997, he engaged in post-doctoral research at Earthquake Research Institute, University of Tokyo. After being a research fellow of the Japan Society for the Promotion of Science in 1999, he also worked at Faculty of Earth Sciences, Vrije Universiteit Amsterdam (from September 1999 to February 2001). In 2002, he joined JAMSTEC and turned to be a senior scientist five years later. Nowadays, he is the senior scientist of the at Department of Solid Earth Geochemistry, JAMSTEC. 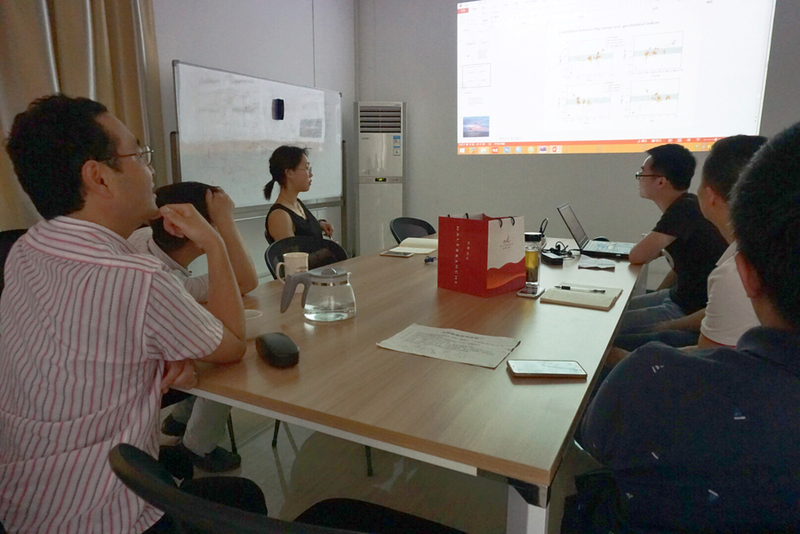 Prof. Hanyu ’s contributions to geoscience are mainly focused in radio isotope geochemistry and astrochemistry, by applying Hf isotope and noble gas isotopes to trace the magma evolution in mantle. His research interests are Geochemistry for ocean island basalts to understand magma genesis in mantle plumes and heterogeneous nature in the deep mantle & Geochemistry for arc magmatism to understand element fractionation and mass transport during slab subduction. His field work includes on-land field work in and outside Japan (Hawaii, Reunion, St. Helena, Samoa, French Polynesia, Pitcairn) & on-board scientific research with “Yokosuka”, “Kairei”, “Mirai” (JAMSTEC) and “Joides Resolution” (IODP). The relative results are already published in the top journals such as Nature, Geology, EPSL, GCA and etc.